"This is an imminently practical workbook that shows a variety of invaluable techniques to get centered, calm and organized. An effective and enjoyable guide to help you feel in charge of yourself." BONUS: Book includes a link to all reproducible worksheets! Print and use with clients right away!! "Linda Curran has carefully and knowledgeably curated a practical, effective collection of interventions that actually work for trauma survivors. Any clinician committed to helping those suffering from posttraumatic stress needs to have these tools and resources to draw upon, because standard talk therapy, nine times out of ten, is simply not going to cut it. These exercises will." 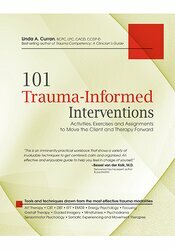 "101 Trauma-Informed Interventions provides an accessible functional “playbook” for therapists committed to the rehabilitation of the client with a trauma history. In a readable volume Curran integrates diverse approaches of treatment and emphasizes the unique role that trauma plays in mental health. Underlying this eclectic strategy is the common theme emphasizing that healing will only begin when the trauma related feelings embedded in the body are appreciated." "An interesting compendium of potential interventions that can be interwoven into any therapist's existing conceptual framework"